A couple of years ago I was in Portugal to give a talk on Gov 2.0 at a conference the government was organizing. After the talk I went for dinner with the country’s CIO and remember hearing about a fantastic program they were running that – for me – epitomized the notion of a citizen centric approach. It was a help desk called: I Lost My Wallet. Essentially, it was a place you went when… you lost your wallet. What the government had done was bring together all the agencies that controlled a document or card that was likely to have been in your wallet. As a result, rather than running around from agency to agency filling out your name and address over and over again on dozens of different forms, you went to a single desk, filled out one set of forms to get new copies of say, your social insurance card, your drivers license, healthcare card and library card. But get this. From the briefing I had, my understanding was that this service was not limited to government cards, they’d also partnered with several private entities. For example, I notice that the service also works for replacing Portugal’s Automotive Club Card. In addition – if I remember correctly – I was told the government was negotiating with the banks so that you could also cancel and replace your ATM/bank card and visa cards at this counter as well. Now this is citizen centric service. Here the government is literally molded itself – pulling together dozens of agencies and private sector actors around a single service – so that a citizens can simply and quickly deal with a high stress moment. Yes, I’d love to live in a world where all these cards disappeared altogether and were simply managed by a single card of your choosing (like say your Oyster card in the UK – so that your subway fare card was also your healthcare card, government ID, and credit card). But we are a few years away from that still and so this is a nice interim service. But more importantly it shows a real ability to shed silos and build a service around a citizen/customer need. I believe they had a similar service for “I bought a house” since this is a moment when a number of different government services become relevant simultaneously. I of course, can imagine several others – most notably a “my partner just died” service could be invaluable at helping people manage a truly terrible moment when dealing with government bureaucracy is the last thing they want to be doing. You can find the website for I lost my Wallet here (it is, naturally, in Portuguese). You can also read more about it, as documented by the European Union here. Lots of food for thought here for those of you designing programs to serve citizens, be it in the public or private sector. This entry was posted in public service sector renewal and tagged CPSR, gov20, public service sector renewal on May 25, 2012 by David Eaves. Okay, let’s geek out on some open data portal stats from data.gc.ca. I’ve got three parts to this review: First, an assessment on how to assess the value of data.gc.ca. Second, a look at what are the most downloaded data sets. 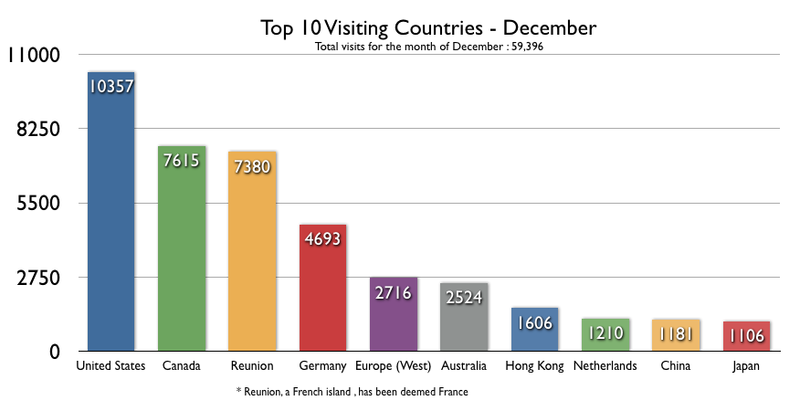 And third, some interesting data about who is visiting the portal. Before we dive in, a thank you to Jonathan C sent me some of this data to me the other day after requesting it from Treasury Board, the ministry within the Canadian Government that manages the government’s open data portal. Here is the first thing that struck me. Many governments talk about how they struggle to find methodologies to measure the value of open data portals/initiatives. Often these assessments focus on things like number of apps created or downloaded. Sometimes (and incorrectly in my mind) pageviews or downloads are used. Occasionally it veers into things like mashups or websites. However, one fairly tangible value of open data portals is that they cheaply resolve some access to information requests – a point I’ve tried to make before. At the very minimum they give scale to some requests that previously would have been handled by slow and expensive access to information/freedom of information processes. Let me share some numbers to explain what I mean. The Canada Government is, I believe, only obligated to fulfill requests that originate within Canada. Drawing from the information in the charts later in this post, let’s say assume there were a total of 2200 downloads in January and that 1/3 of these originated from Canada – so a total of 726 “Canadian” downloads. Thanks to some earlier research, I happen to know that the office of the information commissioner has assessed that the average cost of fulfilling an access to information request in 2009-2010 was $1,332.21. So in a world without an open data portal the hypothetical cost of fulfilling these “Canadian” downloads as formal access to information requests would have been $967,184.46 in January alone. Even if I’m off by 50%, then the cost – again, just for January – would still sit at $483,592.23. Assuming this is a safe monthly average, then over the course of a year the cost savings could be around $11,606,213.52 or $5,803,106.76 – depending on how conservative you’d want to be about the assumptions. Of course, I’m well aware that not every one of these downloads would been an information request in a pre-portal world – that process is simply to burdensome. You have to pay a fee, and it has to be by check (who pays for anything by check any more???) so many of these users would simply have abandoned their search for government information. So some of these savings would not have been realized. But that doesn’t mean there isn’t value. Instead the open data portal is able to more cheaply reveal latent demand for data. In addition, only a fraction of the government’s data is presently on the portal – so all these numbers could get bigger still. And finally I’m only assessing downloads that originated inside Canada in these estimates. So I’m not claiming that we have arrived at a holistic view of how to assess the value of open data portals – but even the narrow scope of assessment I outline above generates financial savings that are not trivial, and this is to say nothing of the value generated by those who downloaded the data – something that is much harder to measure – or of the value of increased access to Canadians and others. Data sets like the Anthropogenic disturbance footprint within boreal caribou ranges across Canada may not seem interesting, but the ground breaking agreement between the Forest Products Association of Canada and a coalition of Environmental Non-Profits – known as the Canadian Boreal Forest Agreement (CBFA) – uses this data set a lot to assess where the endangered woodland caribou are most at risk. There is no app, but the data is critical in both protecting this species and in finding a way to sustainably harvest wood in Canada. (note, I worked as an adviser on the CBFA so am a) a big fan and b) not making this stuff up). It is fascinating that immigration and visa data tops the list. But it really shouldn’t be a surprise. We are of course, a nation of immigrants. I’m sure that immigration and visa advisers, to say nothing of think tanks, municipal governments, social service non-profits and English as a second language schools are all very keen on using this data to help them understand how they should be shaping their services and policies to target immigrant communities. There is, of course, weather. The original open government data set. We made this data open for 100s of years. So useful and so important you had to make it open. And, nice to see Sales of fuel used for road motor vehicles, by province and territory. If you wanted to figure out the carbon footprint of vehicles, by province, I suspect this is a nice dataset to get. Probably is also useful for computing gas prices as it might let you get a handle on demand. Economists probably like this data set. All this to say, I’m less skeptical than before about the data sets in data.gc.ca. With the exception of weather, these data sets aren’t likely useful to software developers – the group I tend to hear most from – but then I’ve always posited that apps were only going to be a tiny part of the open data ecosystem. Analysis is king for open data and there does appear to be people out there who are finding data of value for analyses they want to make. That’s a great outcome. Here are the tables outlining the most popular data sets since launch and (roughly) in February. So this is just plain fun. There is not a ton to derive from this – especially as IP addresses can, occasionally, be misleading. In addition, this is page view data, not download data. But what is fascinating is that computers in Canada are not the top source of traffic at data.gc.ca. Indeed, Canada’s share of the traffic is actually quite low. 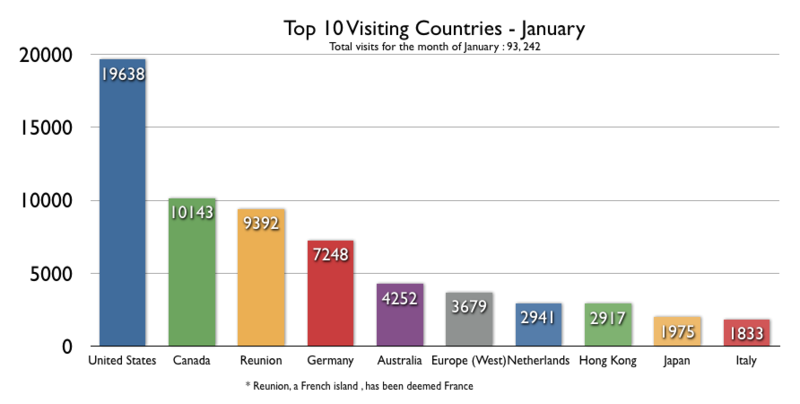 In fact, in January, just taking into account the countries in the chart (and not the long tail of visitors) Canada accounted for only 16% of the traffic to the site. That said, I suspect that downloads were significantly higher from Canadian visitors – although I have no hard evidence of this, just a hypothesis. This entry was posted in commentary, open data, public policy, public service sector renewal, reviews, technology and tagged cdnpoli, data.gc.ca, government of canada, open government, opendata, public service sector renewal on March 8, 2012 by David Eaves. Some of you know I’ve written a fair bit on Google transit and how it is reshaping public transit – this blog post in particular comes to mind. For more reading I encourage you to check out the Xconomy article Google Transit: How (and Why) the Search Giant is Remapping Public Transportation as it provides a lot of good details as to what is going on in this space. First, it really is a story about how the secret sauce for success is combining open data with a common standard across jurisdictions. The fact that the General Transit Feed Specification (a structured way of sharing transit schedules) is used by over 400 transit authorities around the world has helped spur a ton of other innovations. 3%? That is amazing. Last year my home town of Vancouver’s transit authority, Translink, had 211.3 million trips. If the iBart app were ported to here and enjoyed similar success that would man 6.4 million trips planned on iBart (or iTranslink?). That’s a lot of trips made easier to plan. Where else could this model be recreated? What’s the data set, where is the demand from the public, and what is the company or organization that can fulfill the role of google to give it scale. I’d love to hear thoughts. This entry was posted in open data, public policy, public service sector renewal, technology and tagged CPSR, google, opendata, public service sector renewal, transit on February 22, 2012 by David Eaves. Most of the time, when I engage with or speak to federal public servants, they are among the most eager to find ways to work around the bureaucracy in which they find themselves. They want to make stuff happen, and ideally, to make it happen right and more quickly. This is particularly true of younger public servants and those below middle management in general (I also find it is often the case of those at the senior levels, who often can’t pierce the fog of middle management to see what is actually happening). I’m sure this dynamic is not new. In large bureaucracies around the world the self-organizing capacity of public servants have forever been in a low level guerrilla conflict against the hierarchies that both protect but also restrain them. What makes all this more interesting today however, is never before have public servants had more independent capacity to self-organize and never before have the tools at their disposal been more powerful. So, for those who live in work in Ottawa who’d like to learn some of the tools public servants are using to better network and get work done across groups and ministries, let me point you to “Collaborative Management Day 2012.” (For those of us who aren’t public servants, that link, which directs into GCPEDIA won’t work – but I’m confident it will work for insiders). To be clear, it’s the ideas that are batted around at events like this that I believe will shape how the government will work in the coming decades. Much like the boomers created the public service of today in the 1960’s, millennials are starting to figure out how to remake it in a world of networks, and diminished resources. Good luck guys. We are counting on you. When: Wednesday, January 25, 2012 from 8 a.m. to 4 p.m. Cost: Free! Seats are limited; registration is required for attendance. The GCPedia community defines collaboration as being “a recursive process where two or more people or organizations work together in an intersection of common goals—for example, an intellectual endeavour that is creative in nature—by sharing knowledge, learning and building consensus.” And this is exactly what the Collaborative Culture Camp (GOC3) will teach you to achieve at the next Collaborative Management Day on January 25, 2012. At the end of the day you will be able to bring a collaborative toolkit back to your organization to share with your employees and colleagues! Keep up to date on the event by keeping an eye on our GCPedia pages and by following us on Twitter (@GOC_3) and watching the #goc3 conversation (no account needed to check out the conversation!). Questions? Concerns? Feedback? Feel free to email the event organizers or leave a message on our Discussion page on GCPedia. This entry was posted in commentary, public policy, public service sector renewal and tagged CPSR, gov20, government, government of canada, public service sector renewal on January 20, 2012 by David Eaves.